Because I am actively opposed to the use of extreme weather as a warfare agent or medium I was inspired to study doppler radar returns during a still-continuing spell of clear, high pressure airmass over most of the southeast u.s. in other words, it struck me as a good time to look at radar returns when there was absolutely nothing in the sky except clear air. I find it an unimaginable notion to weaponize weather events to cause harm to Americans, or any others, so I wish to protect myself , family and those around the globe from such abominations. I noticed that there is a special kind or radar called nexrad located all over the u.s. that seems to have some peculuar properties that might not bode well for us humans underneath its rays. http://www.wunderground.com/ra…..t; . go here. We have seen on radarmatrix where these types of radar spew out a huge radial burst of energy and so it seems that it is a localized dor effect temporarily heinous, if you will, and the apparent ray-beam mechanism of haarp and other effects. I submit that those images may be disinfo to steer you away from recognizing an effect which I witnessed from scanning the things during a clear sky phase. I repeatedly ran loops and rocks of my local nexrad stations and found when comparing the signal overlays to where I know ground and towers have been gifted, that the orgonized zones showed the local reflectivity to disappear quickly or not manifest at all during the sweeps. This showed me right away that the local reflectivity was in fact a dor field which acted normally in the presence of orgonite and was produced by the radar itself, with it’s sweeping motion. We are to believe that this radar is capable of producing a local dor field by its sweeping and to periodically “burst” with a radial display. What I discovered was a little weirder and a little more radical, a lot more far reaching, and in fact, a workable theory on just how haarp works. We are led to believe that haarp is really only a few massive antennaes worldwide and much too secure and massive to bust with orgonite. Disagree. Many of us have also thought that it was spread worldwide by many, many antennaes of a certain kind. Most recently some thinking considered that all towers everywhere had a haarp function, as that was what our busting efforts, reflected in cloud patterns seemed to bear out. My observations have shown me that there is one more consideration to add to the list of how haarp works, and, therefore to the most effective way of busting it. What I am talking about it a raybeam function that I observed that is shot from the nexrad ball that is invisible until it intersects with a distant dor field set up by a local tower. You can’t see the effects of the beam until it crosssects with another shaped field or raybeam. The old action at a distance thing. I saw signatures in clear skies where either local dor fields or early morning moisture patches were square shaped , persistent and moving slowly in a direction not with the local wind. This was perplexing until I played the loop over and over, very speeded up, and then rocked back and forth, which revealed it’s obvious artificiality. When I drew lines from the sides of the square, they led directly back to the exact location of the next most distant nexrad station. The square was clearly an overlapping interference pattern, intensifying the local dor in a shaped field., causing either moisture (exothermic, adding energy) or a suspension of particulate matter as dor does. While many know that horizontal raybeams have been spotted on weather maps and even said to be evidence of storm manipulation, nothing was said of their origin. I submit that their origin is from the same devices that we believe are used to track the damn storms. The sick irony fits, huh. I say this because I saw two separate signatures which evidenced my claim here. One was the aforementioned. The other was a ray that evtended from a nexrad station out at least 400 miles, a clean ray! In a nutshell, nexrad Doppler radar has a function that allows it to shoot concentrated beams to points 400 miles away that interact with local tower-generated fields or with other nexrad beams, creating atmospheric effects that allow for storm manipulation and most importantly, I believe, storm steering. They can create hot-spots or dor concentrations unseen from a distance, all the while using machinery inside the same ball to track it… diabolic. The solution: we all know weather balls, as we call them, are most heinous. Seers say to gift them the soonest and most. Dolphins have requested their immediate gifting. Use the hotlink above and find the ones near you and take care of business, dude. That link has a blow-up feature that will let you pinpoint it. If you’ve already done the good deed, consider way over-gifting it, say, to the tune of 20 tbs, ok? the reason I say this is because one of the ones I did with that many, has a very small dor field around it and no beam activity was noticed, as I monitored it for a couple of days. The second day when I was monitoring and running the rock feature, I got booted out of the site. That’s when I knew I was onto this important task we must do. How about helping eliminate this ungodly stuff from our atmosphere? It doesn’t impede it’s stated tracking function whatsoever. 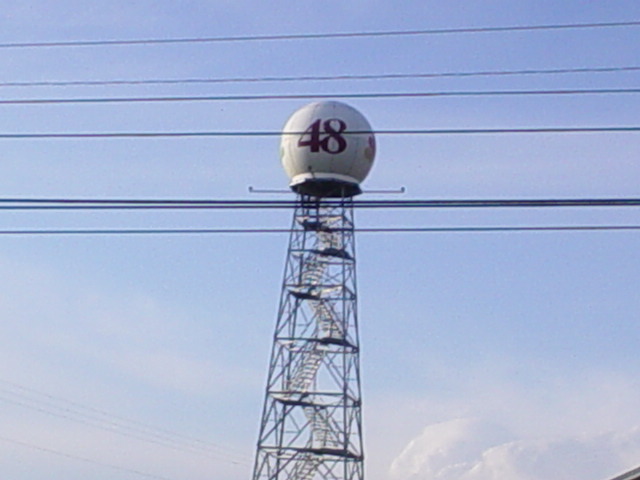 If you have noticed oddities such as this pl,ease say so here and see if you can relate it to a nexrad ball location. i wanted to say that the haarp patterns in my sky right now, where our blue hole isn’t show a unidirectional characteristic leading directly to the nexrad i have not busted, yet. so if you are a ‘they’ you will know exactly where i’m going next, but of course not when or how. heheh–what does it take to get calm seas aroundhere for dolphin soirees, eh? [Image Can Not Be Found] When we got here, we didn’t have a clue that this would require disabling all of the HAARP weaponry within a hundred miles but that’s sure the case. At least teh water looks terrific now. There are plenty of fish and Carol saw that pod of spinner dolphins in the Loxahatchee by the AIA bridge, not far from our place. The Loxahatchee River is now bluegreen and gorgeous, thanks to enough orgonite. This hasn’t been seen in winter for a loooong time and when we got here at the end of summer the water was always brown/gray–yuck. It had almost no fish in it but now the fish are everywhere. A neighbor told me that when he got here from Hoboken, 26 years ago, he often saw dolphins in the Loxahatchee at the mouth of this creek. If that’s going to happen again we won’t have to go so far to consort with them. It’s ten minutes to that place from here with the motorized diveyak. I hope everyone reading this will take the hint and specifically go after the HAARP balls in your area in order to have pristine weather and no more violent storms. Having a cloudbuster is the other thing that ensures the end to weather violence where you live but it takes both, unfortunately; one won’t be sufficient, in our experience. Jeff got an impression that thre are some savage HAARP weapons in the Everglades, which are mostly inaccessible except by boat or aircraft. CArol concurs and we’re going to get to that before the next HAARPicane season starts. We also need to get out to that island, 45 miles off the Florida Gulf Coast, to bust the huge, primary HAARP array. I REALLY don’t want to experience another Wandering Wilma, even though we’d all successfully knocked it down to tropical storm strength. I’m pretty sure we’ll chop HAARP’s feet out from under the sewer rats. I hope Louis Onder and others further around the Gulf will also manage to get that done. Finally got around to gifting the large weather ball in Seville near the airport. It received about 15 tbs completely surrounding it. I was on a bicycle, and on the way home stopped off at a convent where, through the trees, a brilliant light fell through the sky. It was multicolored, and moving quickly. It has been over 8 months since something flew over Seville like that, so it seems a nice confirmation, whatever it was. It is an honor to be a part of the global healing effort. In answer to Don’s comment about taking care of the GULF area, IT’S A DONE DEAL! The only ANGELS that will be playing this HAARP are the ETHERIC WARRIORS (and our affiliates)! louis, you are completely right! you have gifted such a large field and continue to do so , that (poor you ) y’all won’t be able to take time off work anymore from haarpicanes. it was amazing to me that your bosses tried to stick you with some phony ethics violations regarding questions about orgonite. $#!+, i’m gonna do a unit on casting in my sculpture class and send home 250 hhgs soon to cover a whole school area, and the school system will pay for the friggin’ resin! geez… they oughta get a grip, were winning. your steadfastness is an inspiration to us all. i don’t know if anyone mentioned that to you but, i’m saying so now. i’m sure i’ll have the pleasure of meeting you soon, louis. we are all covering florida too and i don’t think haarpicanes are viable here anymore, hence the ‘forecasts’ of haarpicane action on the east coast. but, as with my humor piece on another thread, we will mobilize cbs to affected areas and will also be applying our new etheric solutions to the problem. the nexrad deal is what they use to amp them up according to me, and i hope that all the southern and eastern maritime states have them done by tropical swirl season. i will pm you about the ‘new tech’ involved to see what your thoughts are on it. Ball four, take your base! Good news, the Rexnad ball downtown cleveland and the neighboring FBI HQ are now happily gifted. I was just going for the fbi building but was pleasantly surprised to find the channel 3 building next door, and a large weatherball above!